Grant Union Prospector senior Alcie Moore runs through drills at practice. Grant Union Prospector Abby Lusco, center, and teammates go after a rebound during a scrimmage at practice. Grant Union Prospector Tiler Voigt, center, and her teammates run through drills at practice. Grant Union Prospector Kaytlyn Wells grabs a rebound in practice. Grant Union Prospector senior Madi McKrola makes a layup in practice. Grant Union Prospector senior Kaylee Wright is in action during the team's Nov. 14 practice. Grant Union Prospector senior Marissa Smith is about to make a jump shot, Madi McKrola on defense. 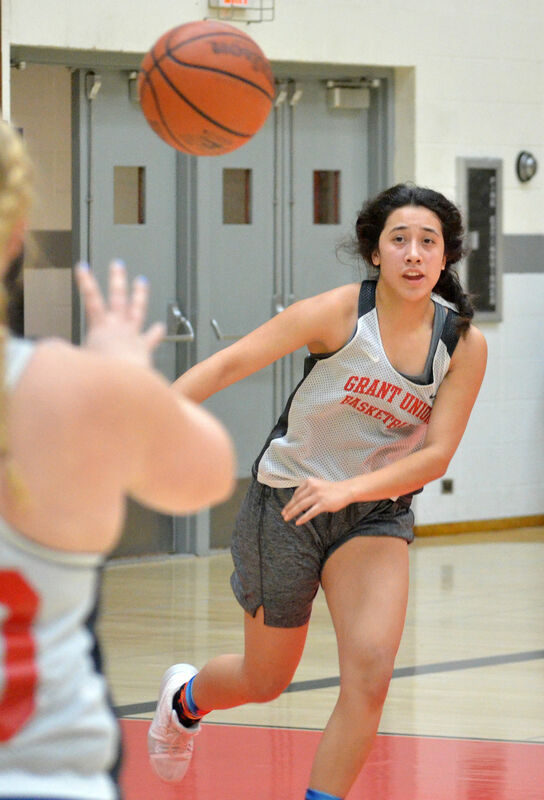 Several varsity players are returning to the Grant Union Prospector girls basketball team, including last season’s all-state co-player of the year Kaylee Wright. The team extended their post-season last year, bringing home the fourth-place trophy from the OSAA Girls Basketball State Championship. They were also Wapiti League champions. It was the Prospectors’ third consecutive run at state, and this season they hope to go even further. The team is led by head coach Kristi Moore, an experienced coach who is taking over where Casey Hallgarth left off last year. Moore’s assistant coach is Alec Moore, her uncle. The junior varsity coach is Jeremy LaFramboise, and the junior high team is led by Doug Sharp. Moore said this year’s varsity team is a well-rounded group with excellent skill sets. “Our goal is to maximize our talents to work together to be the best team we can be, and in doing that, we think that we’ll be successful,” she said. On top of having good teamwork, Moore said the girls are fast with a defensive flair, including attacking the ball and attacking the rim. “They can all shoot, and they can all play defense,” she said. Moore said they have some height this year, and all the girls are good jumpers. Five seniors, who all saw time on the court during the state championship, are leading out for the Prospectors, including Kaylee Wright, Hailie Wright, Madi McKrola, Marissa Smith and Alcie Moore. Rounding out the roster are five juniors, two sophomores and 11 freshmen. Trinity Hutchison, who was a varsity starter last year, has joined the girls wrestling team for her senior year. Three other varsity players graduated, including Mariah Moulton, Mariah Wright and Whitney McClellan. Kaylee Wright, who racked up 72 total points at last season’s state tournament, said that with the skills the returning varsity players are bringing this year she feels confident they’ll go far. “I’m happy all us seniors can lead the team in a positive way this year,” she said. Alcie Moore said the team is close and plays with great intensity and energy, and McKrola said the bench is strong. “I’m excited because our basketball fans are always spirited, and it’s nice having them around, supporting you and cheering you on,” Alcie Moore said. Smith said the team is working hard and giving 100 percent. “We have the potential to go far as long as we keep the tempo high,” she said. Grant Union will face Enterprise and Union again this year, this time in the Blue Mountain Conference. Other league opponents include Heppner, Pilot Rock, Stanfield and Weston-McEwen. Coach Moore said they matched up with Union and Enterprise in tournaments and games over the summer. “They were both very strong,” she said, adding those were the only two teams from the league they faced. Last season, Grant Union beat Heppner at the semifinal consolation round at state. Moore said she’s expecting a competitive league this season. She said they’ll take it game by game and focus on being the best team they can be. “We’re going to move fast ... with a high-intensity defense that leads to, hopefully, a bunch of layups,” she said. Nov. 28: @ Burns at 6 p.m.
Dec. 11: vs. Crane at 6 p.m.
Dec. 14: vs. Burns at 6 p.m.
Dec. 21: @ Heppner at 7:30 p.m.
Dec. 22: vs. Pilot Rock at 5:30 p.m.
Dec. 28: vs. Lakeview at 6 p.m.
Jan. 4: @ Enterprise at 7:30 p.m.
Jan. 5: vs. Union at 5:30 p.m.
Jan. 12: @ Weston-McEwen at 4 p.m.
Jan. 18: vs. Stanfield at 7:30 p.m.
Jan. 19: @ Union at 5:30 p.m.
Jan. 25: @ Pilot Rock at 7:30 p.m.
Jan. 26: vs. Heppner at 5:30 p.m.
Feb. 2: vs. Weston-McEwen at 5:30 p.m.
Feb. 8: vs. Enterprise at 7:30 p.m.
Feb. 9: @ Stanfield at 5:30 p.m.
Feb. 12: @ Crane at 6 p.m.